Charcoal vase pictured above is included! This romantic bouquet was inspired by Lewis Miller's Flower Flash and the florals that adorned Miss Manhattan, a stunning statue tucked inside a little garden on 106th street and Broadway. Miss Manhattan, otherwise known as Audrey Munson, was considered "America's First Supermodel." 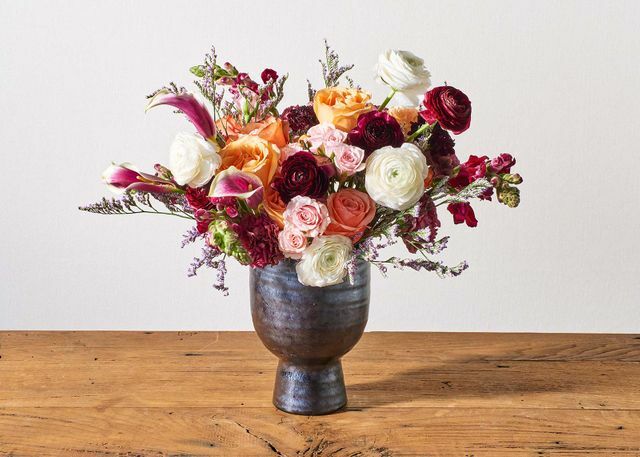 Our bouquet – with a vase included – rivals Munson's good looks with stunning burgundy calla lilies, sprigs of snapdragons, and a plethora of roses. For those unfamiliar with the term Flower Flash, it's an urban street art installation created by Lewis Miller and his team of merry, floral bandits. These Flower Flashes are created under the cover of darkness, usually before dawn and always with living flowers. Portions of the proceeds from this Flower Flash bouquet go to ProjectArt, an organization that empowers youth through free after-school arts education.